It’s been about three years since I last ate chicken. I distinctly remember my final bite, at Five Star Hainanese Chicken Rice in Katong, just a few days before I’d peeled open Jonathan Safran Foer’s “Eating Animals” on an intercontinental flight. I don’t want to ruin your dinner, so I’ll just say that his descriptions of factory farming and antibiotic use in poultry were enough for me to bid farewell—yet again— to the bird. This is a particularly unfortunate breakup for any athlete, since chicken is one of the best sources of cheap and convenient protein around. Enter the Mussel. Mussels are a type of elongated, dark shelled clam inhabiting both freshwater and saltwater, with fairly diverse characteristics in appearance and taste. Their flavor reminds me of floating lazily in the ocean on a breezy day- salty and earthy at the same time. Mussels have been eaten for thousands of years, and were first commercially cultured in the 12th century in France on ropes suspended from buoys. This method—longline farming—has remained largely the same over hundreds of years. 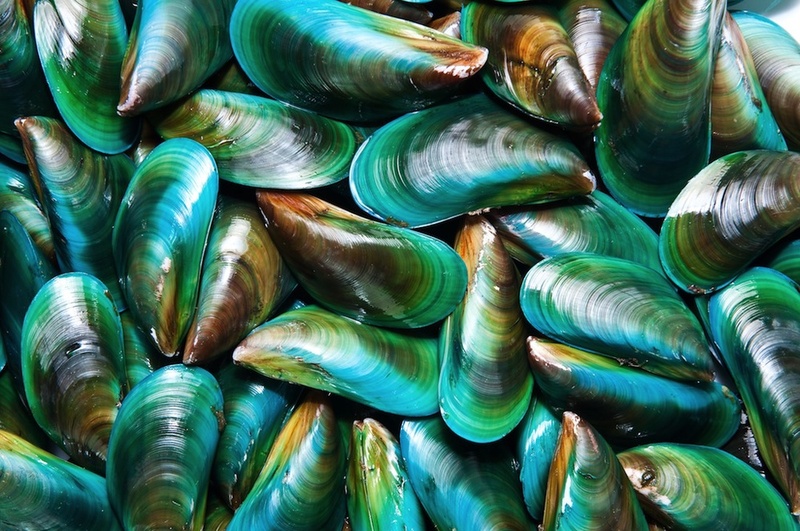 Many of the pre-packaged mussels available regionally hail from New Zealand, Australia and China, but there are also Asian Green Lipped Mussel farms much closer to home, in the Straits of Johor. Due to its nutritional profile, affordability, sustainability and versatility, mussels are hard to beat. A one cup serving of mussels cooked in moist heat contains approximately 130 calories and a whopping 18 grams of protein. Mussels are high in selenium, a trace mineral that plays a critical role in antioxidant metabolism by supporting the enzyme, GPX, which removes hydrogen peroxide from the body and prevents damage to RNA and DNA. Mussels also contain high levels of two long chain fatty acids, EPA (eicosapentaenoic acid) and DHA (docosahexaenoic acid), Omega 3 fats that are vital for healthy brain, eye, joint, skin and cardiovascular function. Their zinc content will help keep cold viruses at bay, and they have more vitamin A and iron than their crustacean counterparts, as well as being a rich source of vitamins B12 and E.
In a large skillet, heat oil over medium heat. Add shallots and sauté until softened, about 8 to 10 minutes. Add thyme and garlic, as well as dry white wine or apple cider vinegar and boil for a minute. Add the mussels, lemon and most of the parsley. Cook for 3 to 4 minutes, until mussels have opened. Sprinkle the remaining parsley and pepper and serve the mussel in bowls with broth. Serves 2-3 hungry people. Voilà! Enjoy! Have a favorite mussels recipe or sustainable protein option? Jot down your thoughts in the comment section!